In the excitement of the new season, supporters are often guilty of creating over-the-top expectations and landing up disappointed when the clubs fail to meet those objectives. Often all we need is a bit of perspective from experts to maintain rational thought; our Q&A mini-series going into the 2014/15 season serves this purpose. 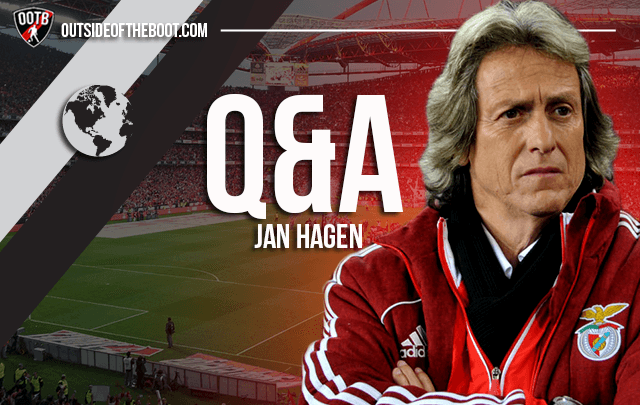 Jan Hagen answered our questions on Benfica. Jan is a Portuguese football expert who is a contributor to FIFA’s official World Cup magazine, Metro Sport and Sport Witness. Having won three trophies last season, what next for Jorge Jesus? Is he now obsessed with breaking the curse of Bela Guttmann himself? 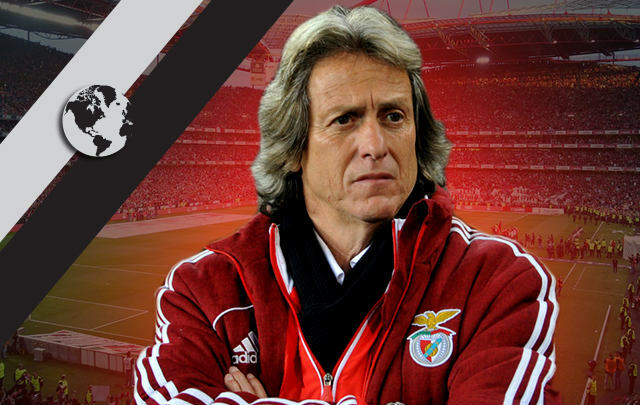 No one is expecting much from Jorge Jesus and his Benfica side this season. Having lost 12 players who were part of the first team last season this summer, it’s unlikely they’ll challenge for the title. Of course, Benfica is a selling club, but replacing the likes of Jan Oblak, Ezequiel Garay, Siqueira, Lazar Markovic and Rodrigo, all extremely crucial parts of Benfica’s treble-winning team last season, are more than difficult. Add important squad players like André Gomes, Ivan Cavaleiro and Óscar Cardozo to that list and you got a nearly impossible task to recreate the results from last season. As Jorge Jesus said himself after losing 5-1 to Arsenal in the Emirates Cup, “We’ve lost eight key players this summer. I’m Jesus, but it will take more than four weeks to build a new team.” Bela Guttmann’s curse will have to wait another year or two. Luisao is the backbone of this defence, and has been for a while. is there anyone in the current squad that you think can serve as an adequate replacement given that he’s now 33? Luisão is a living legend in this Benfica team. O Capitão had a terrific season and with Garay besides him they formed one of Europe’s best centre-back pairing last year. It’s possible to replace Luisão as a footballer, but his loyalty, passion for Benfica and his great personality would be impossible to replace. In today’s Benfica squad Luisão’s companion César has looked promising in the pre-season. Personally I look forward to watch Argentine centre-back Lisandro López this season. He’s got great physic, he’s dominant in the air and he reads the game well. 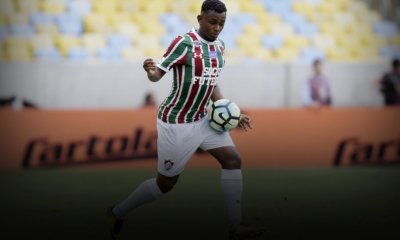 Very similar to Luisão, basically. A technically proficient and hard working midfield was important to the success Benfica enjoyed last season. How does Jesus plan to carry this forward into this season, considering the fact that they’ve lost the likes of Gomes, Duricic & Markovic? Jorge Jesus focused more on the defensive part of the game last season, but attacking football will always be his style of football, this season as well. Benfica have already replaced André Gomes, who never really hit the ground running at the Lisbon club. He was an important squad player for Jorge Jesus, but he never really impressed much. Without doubt a solid footballer, and still only 21-years-old, but he tends to be too slow on and off the ball. Some will say new Brazilian midfield man Talisca is an improvement on Gomes, although he’s more attacking minded. 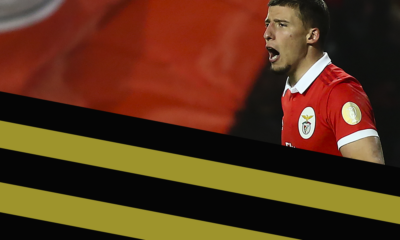 Filip Djuricic won’t be missed at Benfica. Jorge Jesus never gave him a proper chance, and there’s no room for a number 10 in Jesus’ tactic. Djuricic never managed to adapt the box-to-box role nor as a winger. Markovic, however, will be sorely missed. In the absence of Eduardo Salvio, who missed 8 months of the season due to injury, Markovic managed to fill the big hole Salvio left on the right wing. Even though Salvio is back from injury, Ola John has returned after a season away on loan and Bebé has joined the club, the young Serbian will be missed. And that’s the problem with Benfica this season. Their best line-up is pretty good, but the depth and quality of their back-ups is nowhere as good as last season, which is pretty similar to what Paulo Fonseca experienced at Porto last season. Talks of curses aside, have Benfica got a sort of mental block in European matches, or is it just a coincidence? I don’t think Benfica have a mental block in the European competition. Their participations in the last few years’ editions of the Champions League have been dreadful, but beating Juventus and Tottenham, two teams with far greater resources than Benfica, in the Europa League last season was really impressive. Losing to a far superior Chelsea side in the 2012/13 final was inevitable, although Benfica were the better team. This year’s final went down to penalties versus Sevilla, and losing it was disappointing, but I doubt any mental block (or curse) was the cause to their loss. Benfica’s title win ended three successive season’s of Porto taking the league, but the Dragons are constantly improving and have done so again this window. What is your opinion on their new boss and objectives for the season? It’s very exciting times at Porto. Although they have lost important players like Mangala and Fernando, they managed to keep hold of superstriker Jackson Martínez. Losing João Moutinho and James Rodríguez last summer was tough for Porto, and especially because they never managed to replace them properly. This season Porto have bought (and loaned) big. Last season was a disaster, and Porto President Pinto da Costa won’t let that happen again. With the signings of Adrían Lópes, Bruno Martins Indi, Cristian Tello, Casemiro and Yacine Brahimi Porto are lining up as the big favourite to take home the title. We track the progress and performances of youngsters with our Talent Radar feature. 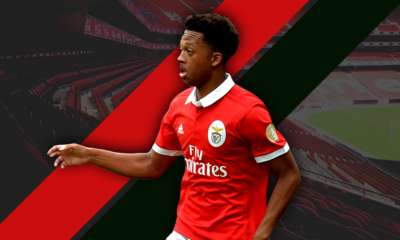 Victor Andrade is one of the most exciting talents at Benfica, and that really is saying something. What can we expect from the youngster? Victor Andrade hasn’t featured much in Benfica’s pre-season, and he’ll probably play at Benefica’s B team in the Segunda Liga this season. João Teixeira on the other hand has been one of very few positives in Benica’s pre-season. The 21-year-old midfielder’s passing and confidence on the ball has been especially impressive, and he’ll certainly get chances for Benfica throughout the season. As a player, Ola John looks like he could be spectacular. Tall, quick, strong, and skillful. Why hasn’t he taken off like he should? It may be the year Ola John gets his breakthrough. He got the attributes and the potential to become something special, and maybe all he needs is Jorge Jesus’ trust. The Dutch winger has faced tough competition at Benfica earlier, but this season he may be the first to replace Gaitán and Salvio whenever they need a rest, which means we’ll get to see a lot of Ola John the upcoming season. Again, having won everything there is to win in Portugal last season, how does Benfica improve? What are fans’ expectations now? Jorge Jesus’ side took another title on Sunday as they won the Super Taça (Portuguese Supercup) versus Rio Ave on penalties. Jorge Jesus became the first Portuguese manager to ever win all four Portuguese titles, but this title may be the only title he wins with Benfica this campaign. The fans don’t expect much from this inexperienced team, and I think they’ll be happy with a top three spot and good runs in both domestic and European cups. Benfica are in a rebuilding phase and I doubt there’s many fans who have high expectations to this side. Although Portuguese sides have done well in Europe’s “second competition”, they look far from achieving success that Porto did exactly 10 years back. While teams that do achieve it always look towards talent from the Portuguese league. What could be the reason then that the clubs lag behind? While the biggest European clubs get wealthier and wealthier, Portuguese teams struggle with the economy and high debts. Combine that with a less competitive league you have the reason why Portuguese clubs hardly manage to build top class teams. If a player does well in Portugal, both player and club receive offers they can’t reject. The clubs needs the money and the player wants higher salaries, better team and a more competitive league. It’s really sad to see your best players leave at every transfer window, but that’s the reality of modern football. A miracle is needed if any of the “smaller” teams in Europe is ever going to challenge the big ones for a spot in a final or semi-final of a Champions League. I believe, given another year with the squad he had as his disposal in May, Jorge Jesus and Benfica could have challenged for big things in the Champions League. If Porto hit the ground running with their new squad they may be the big surprise in the Champions League this season. You can read all our interviews and Q&A’s here. Check out all articles under our Rest of the World blog. Share your thoughts on Benfica with a comment below. Manchester City Tactical Preview: How will Manuel Pellegrini’s side set-up in the 2014/15 season?